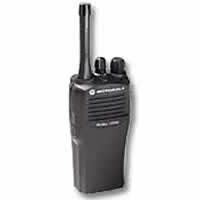 Motorola Radius CP200, VHF (14.. Product weight is 5 lbs. Standard Battery (Li-ion, 2250 mAh, 7.5V - NNTN4497_R) * Standard Charger (90 Min. Rapid Rate- WPLN4138_R) * Standard Antenna (VHF Heliflex 146-174 MHz * NAD6502_R / UHF Whip 403-520 MHz - NAE6483_R) * 3" Belt Clip (HLN8255) * User Guide CD * 2 Year Warranty * 12.5/25 kHz Switchable Channel Spacing * 2 Programmable Side Buttons * X-PandTM Technology * Time-Out-Timer * Busy Chan Lockout * Internal VOX * Single Priority Scan * Adj. Power Levels * MDC1200 PTT ID (Encode * Quik Call II (Decode) * High/Low Power * Channel Scan * Nuisance Chan Delete * Squelch Levels * Rptr/Talkaround * Volume Set * Tight/Normal Squelch * VOX On/Off * LED Battery Indicator The Motorola CP200 portable two-way radio offers the increased communication flexibility with features such as push-to-talk ID and selective call. Powerful audio output penetrates noisy environments, providing clear, crisp audio at any volume. A lightweight, ergonomic design makes this radio comfortable to carry and operate. PLEASE BE AWARE - ALL radios require programming. We include the first 16 channels of programming for FREE. Your order will NOT ship until you respond back to us with your programming plan. Please email the programming information to SEPI@WIRELESSMCIS.COM If you do not require programming, please email us at SEPI@WIRELESSMCIS.COM PLEASE include a phone number where we can reach you with any questions. This price reflects all discounts and manufacturer rebates.